Whence we last examined yonder batting orders, we came away with several expected observations (Jose Bautista plays baseball like a video game, the Oakland Athletics do not care much for scoring runs, Rick Ankiel and Ian Desmond are not feared hitters, and so forth) as well as a number of curious findings (the Cubs lead-off combo was tops in the majors, the 7th hitters on AL teams were worse than the 9th hitters, NL managers effectively managed the bottoms of their lineups, and such). 1) The optimal batting order: A subject widely debated, but to little gain. The worst batting order may ultimately only cost a team a game or two — but, still, we cannot help but prod, poke, and critique it. Tom Tango’s The Book fairly definitively defines the best batting order as: #1, #4, #2, #5, #3, #6, #7, #8, #9 in terms of importance of avoiding outs. 2) The optimal measuring tool: In my last article, a few people had trouble understanding my utilization of wOBA (weighted on base average). This too comes from Tango and is a most intuitive and useful tool. Think of it as smart batting average: Where batting average says homers and singles are worth the same, wOBA says, “Nay!” and then counts each non-out according to the runs it produces. League average wOBA tends to hoover around .320 to .330. A .360 wOBA is good; a .400 wOBA is great; and a .290 wOBA is Yuniesky Betancourt. 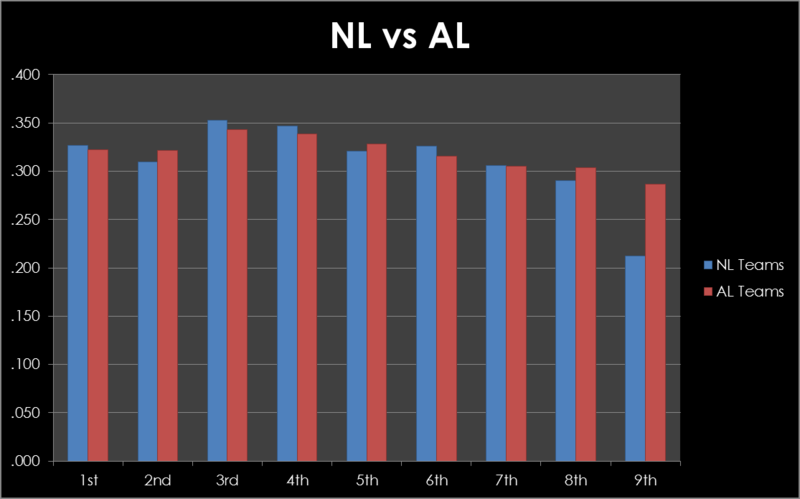 In my last post, I applauded NL managers for arranging the bottom of their lineup efficiently. That remains true; however, they still persist in giving sub-par hitters prime plate appearances in the #2 hole. This is a sport-wide affair, too. The common perception is that the second hitter needs to be a no-power, sac machine like Alexi Casilla, but this belief originated in the Dead Ball Era, whence run scoring was as common as integration. Overall, though, we are seeing the right-skewed bell curve common in traditional baseball theory, with the best hitters clustered in the 3, 4, and 5 spots and “little things” hitters in the 1 and 2 slots. The first statistic I noticed the NL was the drastic and expected regression of the Cubs lead-off hitters. Kosuke Fukudome has continued to receive the largest share of PAs and has pulled his typical hot start trick. His wOBA by month tells the story. 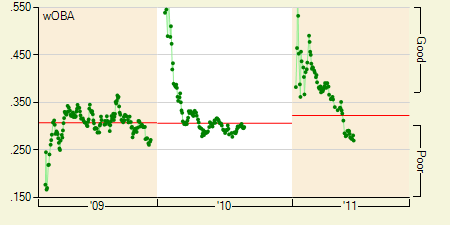 Another observation worth observing is Aubrey Huff and his quite down year (.284 wOBA). It is reminiscent of his forgettable 2009 campaign — and could be an unfavorable portent for the 34-year-old slugger. Meanwhile in San Diego, nine pitchers have elected to bat in lieu of position players. Here’s an example of how trying to produce the best ever batting order is like trying to catch fire in a bottle: Raul Ibanez is having a down year, and Carlos Ruiz is Carlos Ruiz, a catcher. Despite these two obstacles, the Phillies have mustered the most productive 6th spot in the NL. Go figure. Jose Bautista has actually gotten a little “cold” over the last month and a half, hitting a “mere” .400 wOBA in that span. By contrast, I am 0 for 8 with 8 Ks and 6 BBs in my semi-pro league. Could I be the next Bautista? Probably. Eleven blocks south of my house, Alexei Ramirez his giving the White Sox the best #2 production of the league, causing droves of saberists to swoon. Ramirez’ impressive showing in a prime slot almost undoes the damage propagated day-to-day by lead-off hitter Juan Pierre (.289 wOBA, 13 SB, 10 CS). Almost. Be still, my Tangoish heart. We hoped you liked reading wOBA By Batting Order: 2011 All-Star Break Update by Bradley Woodrum! Ha! Sure enough! Good catch!